The ancient powers never fully went away. They wander our roads and cities, mingling with the teeming masses of humanity. You are one of their children, born to the magic of yesterday and the promise of tomorrow. Now begins the war against the Titans, elder beings who rage against the human world and its wayward gods. Commanding the push and pull of Fate, you will ride into battle and work wonders, the better to prove yourself worthy of legends. 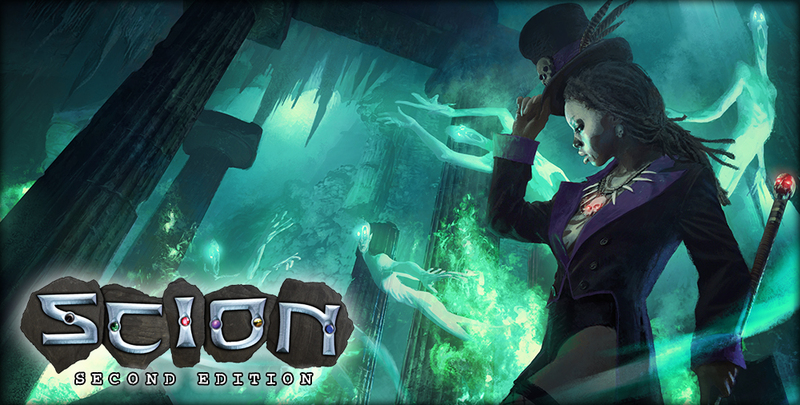 Scion is a contemporary game of modern myth and epic heroism. Its first edition was published in 2007, and it quickly gained an enthusiastic following, winning the ENnies Game of the Year award. Originally slated as a simple three-book series, its fervent following merited an expansion beyond those original limits, resulting in a series of books and PDFs released over the next several years. Onyx Path is proud to oversee the publishing of an entirely new edition of the game. If this sounds interesting to you, head over to our DriveThruRPG storefront to get Scion: Demigod 1st Edition. Second edition coming soon! Scion merchandise is available via our RedBubble store.